When your team needs wholesale soccer patches, we’re your no-hassle, goal-scoring source for great patches, unbeatable prices and terrific customer service! NOW YOU CAN GET WHOLESALE SOCCER PATCHES NO MATTER YOUR BUDGET! Our top-quality materials and artwork, combined with our rigorous quality control means your wholesale soccer patches will be the best available. As far as price goes, we won’t be undersold, so you can get great custom patches, regardless of the size of your budget! SOCCER PATCHES WITH A KICK! If you want patches that look fantastic, stand up to the toughest conditions and represent your team spirit, we’ve got what you’re looking for. 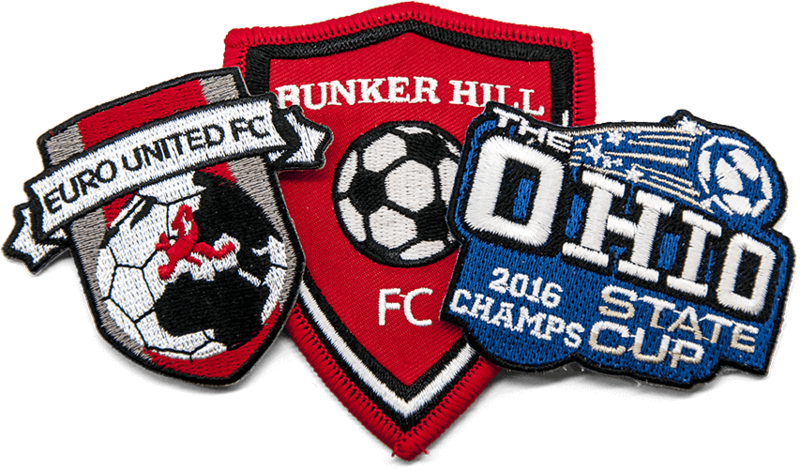 Our wholesale soccer patches are made with the toughest, most durable embroidery thread and backing twill available. Our computer-controlled embroidery machines ensure consistent design and stitching. And our graphic artists can help you craft a design that’s perfect for your team. We use state-of-the-art equipment to ensure consistency and stitch quality. We offer a full range of attachment / backing options. And we stand behind every patch we sell with our 100% Satisfaction Guarantee.